Tempe, AZ – The sun came up today across Sun Devil Nation, but the smell of roses has faded in the distance. Nonetheless, new expectations for ASU Football are clear. After a heartbreaking 38-14 loss to Stanford last night in the Pac-12 Championship, it’s time to reflect on the game with some perspective and appreciation for what the ASU football team accomplished in 2013. The Sun Devils came into the game with confidence and were the favorite of most college football analysts. They felt that this was a different ASU football team that was knocked around in Palo Alto earlier in the season. The stars seemed aligned and the home town fans were rocking Sun Devil Stadium at kickoff. Even with all those positive vibes, ASU had little room for error against the defending champs, yet made plenty of them. Special teams were horrible. There were missed assignments on defense. Jaelen Strong dropped multiple passes. And there was a questionable coaching call on the goal line at a crucial point in the game. Marion Grice was out and D.J Foster, who delivered in the first half, went down on the first play of the third quarter with a left knee injury. Prior to getting hurt, Foster played like a warrior. He put the team on his back in the first half with two exciting touchdowns that not only kept ASU in the game, but pumped life and energy into the home crowd. Regardless, Stanford was the better team last night. 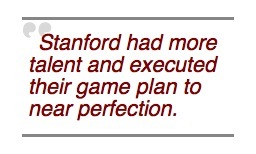 They had more talent and executed their game plan to near perfection. On offense, the Cardinal ran designed plays to exploit even small weakness in the top-ranked Sun Devil defense. On defense, they locked up ASU receivers and applied pressure to Taylor Kelly and what was left of the running game. Stanford played like champions and are headed to the Rose Bowl for the second straight year after defeating Wisconsin 20-14 last season. For ASU, this season was an important journey in sustaining an elite level of football against one of the toughest schedules in the nation. And while its destination surpassed expectations, it fell just short of the promised land. Coach Graham has taken this program back to respectability in two years. He has set the foundation to move forward with consistent success. His work ethic is fierce, and Graham and this program are far from satisfied. They will look to repeat as division champions and get their next opportunity at the Rose Bowl, nothing less. The Sun Devils earned 10 wins in 2013, finishing #16 in the AP. They maintained a national ranking throughout their final 6 games. They beat Wisconsin who finished the year ranked #19, defeated both L.A. schools, stunned the Washington Huskies and kept the Territorial Cup home in Tempe for the second straight year. 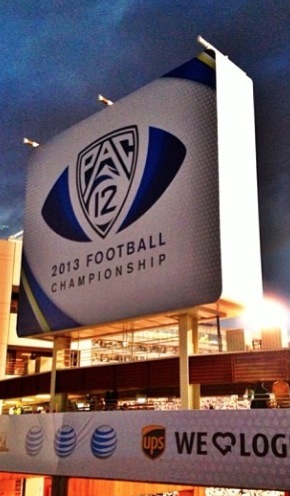 The Sun Devils finished as the Pac-12 South Champions and hosted the conference title game. On December 30, ASU will play Texas Tech in the National University Holiday Bowl. As the team left the field after the Stanford loss, Sun Devil fans chanted “ASU, ASU” and applauded the players and coaches to show their respect. This team is back in the national conversation and fans are embracing and donating to the program they have been hungry for. Time to earn Win #11 and the Holiday Bowl Championship trophy. Then get back to work.